NASA budget could be significantly stretched if a less expensive rocket could be developed. One method to reduce the size, weight and cost of a rocket would be to carry much less rocket fuel. Our approach to going into space has barely changed since the initial design decisions were made in the 1950s and 1960s. The decisions, made during the Cold War era, were based on proving to the Russians that our rockets could reliably destroy Russian targets and thus provide a deterrent. The exploration of space was only a subterfuge. The design decisions shaping the U.S. space program scarcely considered making the program practical, economical or low-cost. It didn’t matter how much the rocket cost if it prevented a Russian nuclear bomb from reaching the U.S. Why do we continue to make only small incremental improvements to a fundamentally non-practical launch system? The overriding issue determining the efficiency, practicality and recurring expense of a space launch vehicle is the excessive weight of the rocket fuel compared to the payload being lifted into LEO. Previous designs have not focused on reducing the fuel load. If you can reduce the weight of the fuel, it takes less energy to lift the craft, resulting in a smaller, less expensive and more efficient launch vehicle. Adding any weight requires adding fuel weight, which quickly results in a larger and larger launch vehicle. Conversely, reducing any of the weight, payload, vehicle or fuel, can result in a dramatically smaller, less expensive launch vehicle. The book “What If We Made Space Travel Practical?” proposes solutions that can reduce the fuel load by as much as 80 percent. It follows that the size and cost of the spacecraft is also reduced by 80 percent. If we also designed the spacecraft to be economically reusable, the cost of space travel could be reduced by 95 percent. NASA budget constraints could be resolved if a new type of rocket fuel is used. This is critical since 90 percent of a rocket’s weight is the rocket fuel. There is a method that provides for a great deal of this rocket fuel to be gathered from the atmosphere as the spacecraft is ascending. Indeed 80 percent of a rocket’s weight is typically the oxygen fuel it carries in tanks internally to the spacecraft. NASA budget would benefit if less rocket fuel was required to be carried along the entire mission. Using atmospheric oxygen could reduce this weight. NASA budget would stretch much further if a more economical launch system can be developed. 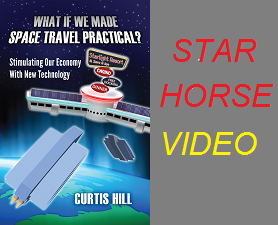 The book “What If We Made Space Travel Practical?” provides solutions to NASA budget issues.